Should a coach be curious? On Twitter recently I have noticed a few people talking about the qualities that a good coach might have. One of the qualities that has been raised more than once is that of being curious. 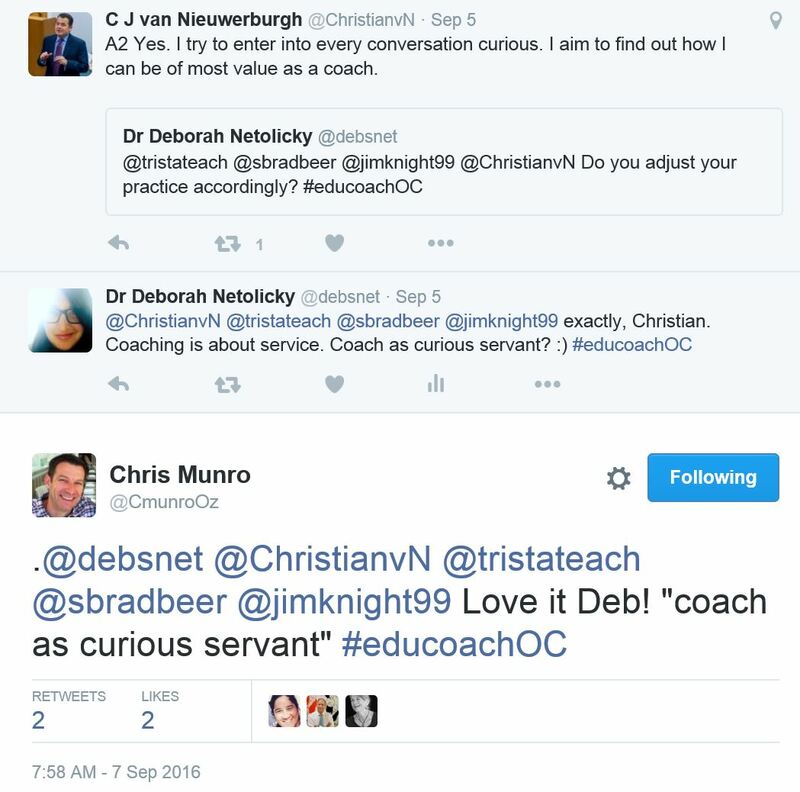 During the last #educoachOC chat, I had this interchange with two respected voices in educational coaching, Christian van Nieuwerburgh and Chris Munro. And it got me thinking. What might be the focus of a coach’s curiosity? Does being of valuable service as a coach involve being curious? Does being curious mean showing genuine interest in a coachee and demonstrating eagerness to hear the details of their experiences? Is it about paying close attention or finding out more? Does a coach’s desire to find out more make a coachee feel valued and empathised with, or does it sidetrack the purpose of the conversation? Autobiographical: This is ‘me too!’ listening in which the listener is compelled to share experiences of their own that they see as relevant to the speaker’s experiences. The coach needs to restrain their urge to be drawn into thinking or speaking about their own stories. Solution: This is listening in which the listener is drawn to thinking up their own solutions to the listener’s problems. Rather than problem-solving, the job of the Cognitive Coach is to assume that a) the coachee knows their own context and problem best, and b) has the capacity to solve their own problems, using the coaching toolbox to help that person access their own internal capacities and thereby developing their self-efficacy. Inquisitive: This is curious listening in which the listener wants to know more about the details of a particular situation. However, the purpose of a coaching conversation is not for the coach to know intimate details, or to provide advice, so what purpose does curiosity serve in a coaching conversation? Who is it helping? Coaching is a form of self-restraint: setting aside personal preferences; refraining from telling one’s own stories; withholding one’s own ideas or advice. Coaching is a service and the coach a servant. The coach is mirror, conduit, bucket in the well, water on the grass; a gentle influence that helps the coachee be the best version of themselves, and move towards where it is that they want to go with increasing capacity. In Cognitive Coaching this capacity development is focused around the Five States of Mind: consciousnesses, craftsmanship, efficacy, flexibility and interdependence. So, should a coach be curious, or is curiosity a form of self-ish, rather than self-less, listening? If a coach’s questions are focused on seeking to understand the inner details of a coachee’s experiences, is that of value to the coachee? Often I find that as a coach I don’t need to know details. The coachee knows the details of their own situations and their thinking is benefited by being able to focus on where they want to go, rather than recounting minutiae for my benefit. What do you think? Should coaches be curious, and if so, about what? If coaches are on a need-to-know basis, what exactly do they need to know? 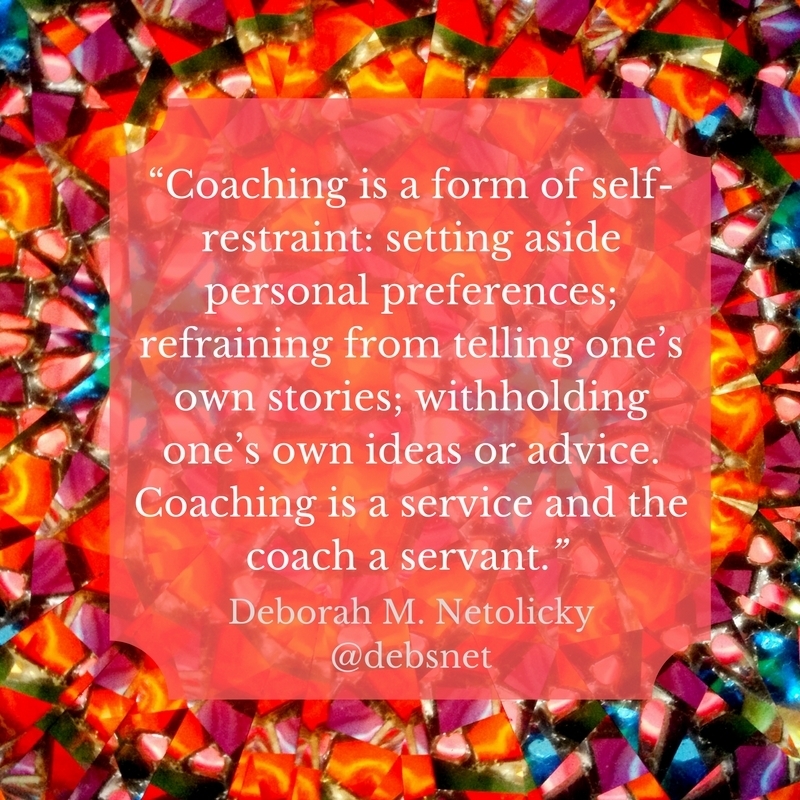 This entry was posted in Coaching, Professional Learning and tagged coaching, Cognitive Coaching, curiosity, listening by Dr Deborah M. Netolicky. Bookmark the permalink. Thanks, Janelle. I keep thinking about how this is explained through the course. There’s a difference (a fine line?) between being inquiring for the benefit of the coachee and being curious for the interest of the coach. Thanks for another brilliant post. I love the way that our coaching community, who may be adopting slightly different approaches to the process and application of coaching in our contexts, identify tensions in the language and help each other to tease these out. The end product, more often than not, is greater clarity and the identification of common underpinning principles and philosophies of coaching. You’ve made me examine the nature of being curious and how we explain the subtleties of what this means in a coaching context. The three “set asides” you describe are really helpful and I can see how the term “curious listening” could be interpreted as listening for the (selfish) benefit of the coach rather than for to assist the coachee’s thinking. I agree that coaches need to exercise self-restraint or conscious self-management so that they avoid becoming ‘sucked in’ by their own interest in the issue at hand. I think that this is part of the coach ‘paddling hard under the surface’ that you’ve described before. Clearly, the kind of curiosity that you’ve described is not what I had in mind when I used the term. If curiosity, or inquisitiveness, are about a general way of being that conveys presence, interest and a learning partnership, then I’m still happy with it. I also associate curiosity with adopting a ‘beginners mind’ when entering into a coaching conversation. We could probably use another post to tease out these terms too! I think that curiosity for the benefit of the coachee (as it always should be) is about listening to understand and seeking clarity (for the coachee) and in doing so, raising their awareness of what’s happening and what’s wanted. I think a certain amount of probing is needed to gain clarity and to trigger new ideas and ways of seeing things. Part of the skill of the coach is in ‘reading’ the conversation and judging when to intervene and with what sort of question (or paraphrase). They need to judge whether to ask a question that expands, deepens or focuses the coachee’s thinking. Thanks so much, Chris. I like curiosity as “a general way of being that conveys presence, interest and a learning partnership”. Thanks for another great post Deb. I remember in my first day of Cognitive Coaching where we were introduced to coaching set-asides, I immediately identified inquisitive listening as my area of weakness. I am so dar curious, and it has taken me sometime to learn how to suppress the inquisitiveness. Thank you, Naketa. My challenging set-aside is autobiographical. I just love a good story! It’s been great to focus on the stories of others; their journeys and their thinking. As you point out, I think it matters if the curiosity is relevant for the issue at hand. Without curiosity I would not be able to get to the heart of the issue.